South Africa is one of the most unequal societies in the world. It is worth it to examine how it has evolved to this state of affairs as South Africa’s ruling African National Congress began deliberations Monday in a disciplinary hearing to decide the fate of Julius Malema, the leader of the party’s youth league. 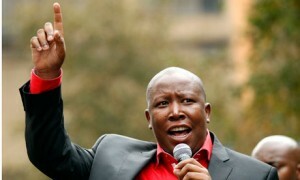 Malema, whose political observations and blatant truth telling has made him one of South Africa’s most controversial figures, he faces possible expulsion from the party if found guilty in the internal disciplinary process, where he is charged with “sowing divisions” in the ANC and bringing it into disrepute. “Yesterday was closing arguments for both parties. They are done with that now. From today the national disciplinary committee will be finalising their verdict,” ANC spokesman Keith Khoza said. Closing arguments in the case wrapped up late Sunday night, after having been rescheduled twice, Khoza said. Five other top ANC youth league officials are also charged in the case, which is widely seen as a battle for influence in the party once led by democracy icon Nelson Mandela, ahead of party elections next year. The first day of hearings in August saw hundreds of Malema supporters clash with police outside the ANC’s headquarters in downtown Johannesburg, burning pictures of Zuma and hurling rocks at police and journalists. Malema, 30, has become one of South Africa’s most controversial figures since being elected president of the youth league in 2008. With his calls to seize back South African land and redistribute the country’s wealth, he is a galvanising figure for many black youths. But his popularity has made him a thorn in the side of senior ANC figures, including Zuma.